In order to plan monitoring programs of the phytoplankton community for classification of the ecological status of water bodies, it is important to know the amount of variability subject to the variation between stations, samples, sub-samples and the processing of samples. Without this information it is not possible to develop a smart sampling design and assign the available resources appropriately. The pigment-based community structure of samples collected in the WISER project were mainly related to salinity and temperature and reference conditions could not be established due to the lack of reference sites within the specific salinity regimes. Although pigment-based results are not directly comparable to results obtained by the traditional microscopic method, they are cost-efficient and much less time consuming than traditional analysis in the microscope. Results from a large-scale study quantifying the sources of variation in the assessment of phytoplankton communities across European water bodies showed that the 10-68% of variation was attributable to the variation between stations. For measurements of population density recorded as number of cells l-1 the main proportion of the variation (35%) was explained by the variation between the taxonomists counting the samples. The large natural variability and the major influence from salinity and temperature on the distribution pattern of phytoplankton render pigment-based phytoplankton assessment highly uncertain. Different and commonly unknown accumulation and preservation rates of the different pigments in sediments reduce the possibility of describing quantitative reference phytoplankton communities from the fossil record. Thus, reference conditions for pigment composition could not be established. The study however, also revealed that the precision of estimates of pigment concentrations for a specific water body can be enhanced by increasing the sample efforts (number of stations). Furthermore, continuous training and intercalibration of the staff involved in counting is the single most important measure to enhance the precision of estimates of phytoplankton density. For more detailed results, please consult Deliverable D4.1-1 (Identification of type-specific phytoplankton assemblages for three ecoregions), D4.1-2 (Report on assessment of pigment data potential for multi-species and assemblage indices) and D4.1-3 (Sources of Uncertainty in Assessment of Phytoplankton Communities) in our results & deliverables section. A multi-metric index of the size spectra sensitivity of phytoplankton (ISS-phyto), which integrates the size structure metrics with metrics describing the sensitivity to anthropogenic disturbance, chlorophyll a and species richness was developed. The index was found to produce significantly higher values at undisturbed than disturbed sites and thereby being a promising indicator to assess the status of phytoplankton communities. Relatively few indices have been proposed for the assessment of the community structure changes of coastal and transitional water phytoplankton. Morphological-functional traits of phytoplankton with different cell size and size spectra show a specific response to different types of anthropogenic pressures. Nevertheless, very few attempts have been made so far to utilise functional traits such as body size, at the individual level, or size spectra, at the guild or community level, to develop multi-metric assessment tools compliant with the WFD. We have developed, tested and validated a multi-metric index of size spectra sensitivity of phytoplankton (ISS-phyto), which integrates size structure metrics with metrics describing the sensitivity of size classes to anthropogenic disturbance, chlorophyll a and species richness measures. The ISS-phyto was developed using phytoplankton data of 14 Mediterranean and Black Sea transitional water bodies (i.e. coastal lagoons), which were classified as either "disturbed" or "undisturbed" ecosystems based on expert quantitative analysis, evaluation of anthropogenic pressures in the catchment area and their current protection and conservation status. The index was found to discriminate between natural and anthropogenic pressures presenting significantly higher values at undisturbed than disturbed sites; it was also tested successfully to a different set of lagoon and coastal areas in the WISER field studies. The new metric ISS-phyto is a promising tool for assessment of the response of the phytoplankton community on eutrophication pressure in transitional and coastal waters and is recommended for further testing as a WFD monitoring tool in coastal lagoons. More detailed analysis and results are being presented in Deliverables D4.1-x and are available for download in our results & deliverables section. Macroalgae constitute a key biological quality element both for transitional waters (TW) and coastal waters (CW). Four macroalgal assessment methods have been developed in the WISER project: BMI (Blooming Macroalgae Index) MarMAT (Marine Macroalgae Assessment Tool), RICQI (Rocky Intertidal Community Quality Index) and the RSLA (Reduces Species List with Abundance). The first one is specific for transitional waters, whereas the three others are for marine water bodies. All these methods are easy to apply in intertidal areas (soft-bottoms in transitional waters and rocky shore in coastal ones). These methods were developed based on macroalgae features that are sensitive on degradation of marine environments resulting in decline of some sensitive species or in abnormal development of opportunistic taxa which are more tolerant to lower environmental quality. These assessment tools combine simple metrics from macroalgae, such as the species richness, the proportion of chlorophyta, the proportion of opportunists or the cover of some taxa. The structural and functional characteristics of macroalgal taxa/communities are sensitive to changes in environmental conditions, justifying the inclusion of metrics based on measurable attributes from marine macroalgae. The marine macroalgae thriving on hard substrata, as sessile organisms, are good indicators for environmental degradation along coastal and transitional waters in Europe. There are already traditionally macroalgae monitoring programmes to assess the quality of coastal and transitional waters in Europe. The applications of BMI, MarMAT, RSLA and RICQI macroalgae assessment tools are easy to use and already intercalibrated, thus those are recommended to be tested as potential indicators to be used on different monitoring programs along European coasts. These studies are included in WISER deliverable D4.2-1 and are published in Ecological Indicators. Isabel Díez; María Bustamante, Alberto Santolaria, Javier Tajadura, Nahiara Muguerza, Ángel Borja, José Ignacio Saiz-Salinas, José María Gorostiaga, Iñigo Muxika. 2012. Development of a tool for assessing the ecological quality status of intertidal coastal rocky assemblages, within Atlantic Iberian coasts. Ecological Indicators, 12: 58-71. doi:10.1016/j.ecolind.2011.05.014. Several different indices have been proposed and may be used to classify the status of benthic invertebrates in transitional and coastal waters, and in lagoons. However, the response of such methods to human pressure gradients is critical in accepting them as suitable tools in assessing the ecological status within the WFD. Until now, very few studies investigated such response of methods already accepted within the WFD. We investigated 13 single metrics (abundance, species richness, Shannon’s diversity, AMBI, five ecological groups, Margalef index, SN, ES100, and ES50) and 8 multimetric methods (ISS, BAT, NQI, M-AMBI, BQI, BEQI, BITS, and IQI), officially used by Member States, to assess coastal and transitional benthic status along clear human pressure gradients (including hydromorphological changes, waste water discharges, eutrophication, aquaculture, etc.) in 5 distinct environments across Europe: Varna bay (Bulgaria), Lesina lagoon (Italy), Mondego estuary (Portugal), Basque coast (Spain) and Oslofjord (Norway). Within each system, sampling sites were ordered in an increasing pressure gradient according to a preliminary classification based on professional judgement, and the response of single metrics and assessment methods to different human pressure levels was evaluated. The different indices are largely consistent in their response to pressure gradient, except in some particular cases (i.e. BITS, or ISS, in some cases). Inconsistencies between indicator responses were mostly in transitional waters (i.e. IQI, BEQI), highlighting the difficulties of the generic application of indicators to all marine, estuarine and lagoon environments. However, some of the single (i.e. ecological groups approach, diversity, richness, SN) and multimetric methods (i.e. BAT, M-AMBI, NQI) were able to detect such gradients both in transitional and coastal environments. The agreement observed between different methodologies and their ability to detect quality trends across distinct environments constitutes a promising result for the implementation of the WFD's monitoring plans. This study has been published in WISER Deliverable 4.3-1 and in Marine Pollution Bulletin. Borja, A., E. Barbone, A. Basset, G. Borgersen, M. Brkljacic, M. Elliott, J. M. Garmendia, J. C. Marques, K. Mazik, I. Muxika, J. M. Neto, K. Norling, J. G. Rodríguez, I. Rosati, B. Rygg, H. Teixeira, A. Trayanova, 2011. Response of single benthic metrics and multi-metric methods to anthropogenic pressure gradients, in five distinct European coastal and transitional ecosystems. Marine Pollution Bulletin, 62: 499-513. Structural taxonomically-based components of the benthic macroinvertebrates communities have been used to assess ecological status (sensu WFD) of lagoon ecosystems. However, as lagoons are naturally euthrophic and selective ecosystems, individual species traits can have a major influence on the species' distribution and their response to disturbance; functional traits, as body size and size spectra actually respond to different types of anthropogenic pressures. Nevertheless, few studies have utilised functional traits such as body size, at the individual level, or size spectra, at the guild or community level, to develop multimetric assessment tools compliant with the WFD. We have developed, tested and validated a multi-metric Index of Size Spectra sensitivity (ISS), which integrates size structure metrics with metrics describing the sensitivity of size classes to anthropogenic disturbance and species richness measures. The ISS was developed using benthic macroinvertebrates data of 12 Mediterranean and Black Sea transitional water bodies (i.e. coastal lagoons), which were classified as either "disturbed" or "undisturbed" ecosystems based on expert quantitative analysis, evaluation of anthropogenic pressures in the catchment area and their current protection and conservation status. Data from a thirteenth Mediterranean lagoon, characterised by a very strong abiotic stress gradient, were used for validation purposes. 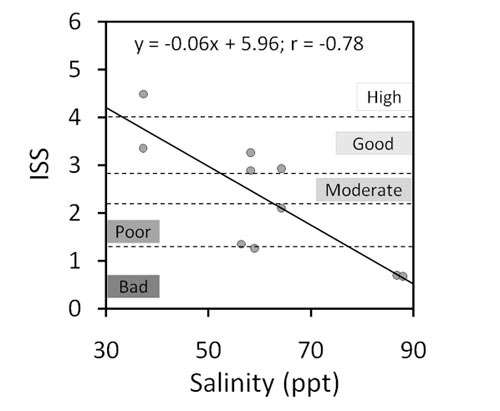 The index is effective to discriminate between natural and anthropogenic pressures presenting significantly higher values at undisturbed than disturbed sites (Figure 1); it showed well defined and highly significant dose-response relationships along different stress gradients, such as the salinity gradient in Margherita di Savoia salt pan (Figure 2). The new metric proposed for transitional waters is a precise and sensitive tool for discriminating various levels of ecosystem disturbance and easy to apply. The ISS has more practical advantages than disadvantages (Table 3), which favour its widespread use as a monitoring tool in coastal lagoons. Table 3: List of advantages and disadvantages of the Index of Size Spectra Sensitivity (ISS). This study has been published in Ecological Indicators. Basset, A., Barbone, E., Borja, A., Brucet, S., Pinna, M., Quintana, X.D., Reizopoulou, S., Rosati, I. Simboura, N., 2012. A benthic macroinvertebrate size spectra index for implementing the Water Framework Directive in coastal lagoons in Mediterranean and Black Sea. Ecological Indicators, 12: 72-83. Using a matching combination of fish index, reference values and local dataset, the transitional fish index (and metrics) can be sensitive to pressure gradients. There is a proven negative response of fish quality features to pressure gradients, which make them suitable for biological quality assessments of transitional waters. The model identified a mixture of relevant pressure and hydromorphological covariates and indicates that, in this case, the deeper the estuary, and the shorter the residence time, the pressure index and the channelled ports within the estuary, then the higher the AFI values would be, indicating higher ecological quality. AFI clearly decreases with the increase of pressure proxies and morphological pressures. Similar analysis for the EFAI found comparable negative response of the index scores with increasing values of pressure proxies (see Figure 1). In this case, the EFAI responded to the overall anthropogenic pressure level. Furthermore, the good results of the intercalibration exercise suggests that each fish tool included in that analysis is in fact reacting in a common manner to a same level of human pressures, and providing a good agreement between methods in the diagnosis of ecological status. This is the ultimate goal of using fish in ecological assessments and suggests that all inter-calibrated indices are relevant and valuable indicators of human pressures in their own right. That is, there are providing an indication of ecological status independently of the pressure proxies used in the development and calibration steps. In addition to the regression approach, an alternative method to establish metric-pressure relationship using a Bayesian approach was test-trialled in Drouineau et al. (2012). The Bayesian method allows the ability both to select relevant fish metrics and to combine them taking into account their sensitivity to pressure, their variability or any other relevant feature. For example, the method can also be a way to integrate data from expert opinion and it finally gives an assessment of the uncertainty of the diagnostic tool. It was tested on a dataset composed of a sample of 14 French lagoons. The analysis suggests that the quality diagnostics are less variable at the level of the multi-metric indicator than at the level of the fish metrics considered individually. The BQE fish response to pressure fields in transitional waters provides a high level of ecological integration to the quality evaluation of transitional water systems. The Fish BQE is a sensitive indicator of ecological status and will be valuable to identify those specific pressures affecting fish assemblages providing targets for minimising the effects of stress in mitigation and restoration plans. Whole indices provide more consistent overall ES assessments but fish metrics considered individually may be more useful as a means to focus restoration measures. More detailed analysis and results are being presented in Deliverables D4.4-x and are available for download in our result & deliverable section. Assessing the benthic invertebrate quality status of coastal and transitional water habitats requires to set up both: (i) indices to assess the relative quality of the considered habitat, and (ii) reference conditions for which such indices can be computed and used to infer the absolute ecological status (ES). The development of indices, their comparison and the assessment of the causes of their discrepancies have been largely discussed but less attention has been paid to the methods used for the setting of adequate reference conditions, although this step is clearly crucial for the sound assessment of ES. We have reviewed the approaches available in setting both reference conditions (pristine areas, hindcasting, modelling and best professional judgment) and targets (baseline set in the past, current baseline and directional/trends). We scored the use of pristine or minimally impacted conditions as the best single method; however, the other methods were judged as adequate then combined with best professional judgement. The case of multivariate AMBI (AZTI’s Marine Biotic Index) is used to highlight the importance of setting correct reference conditions. 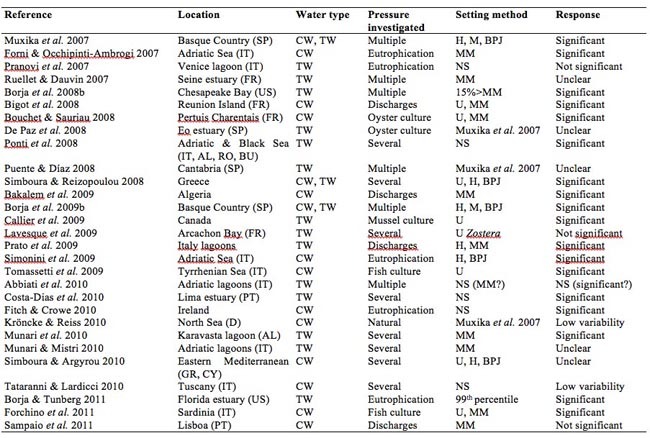 Hence, data from 29 references, including 14 countries from Europe and North America, and both coastal (15 cases) and transitional (17 cases) waters, have been used to study the response of multivariate AMBI to human pressures (Table 1). Results show that the inability of this index to detect human pressure is in most cases linked with the use of inappropriate methods for setting reference conditions. When inadequate reference conditions are set, the results from the methods used to assess benthic status, within the WFD, can be wrong and not comparable (or intercalibratable) with other methods using right reference conditions. Borja, Á., D. M. Dauer, A. Grémare, 2012. The importance of setting targets and reference conditions in assessing marine ecosystem quality. Ecological Indicators, 12: 1-7. Defining 'reference conditions' (sensu WFD) in Mediterranean lagoons is a challenging issue for three main reasons: (i) Mediterranean societies have used lagoons for centuries; (ii) lagoons are naturally enriched, physically stressed and patchy ecosystems; and (iii) lagoon guilds have high taxonomic redundancy and low similarity. Until now, very few studies developed methods for setting adequate reference conditions, although this is an important step in assessing the ecological status within the WFD. 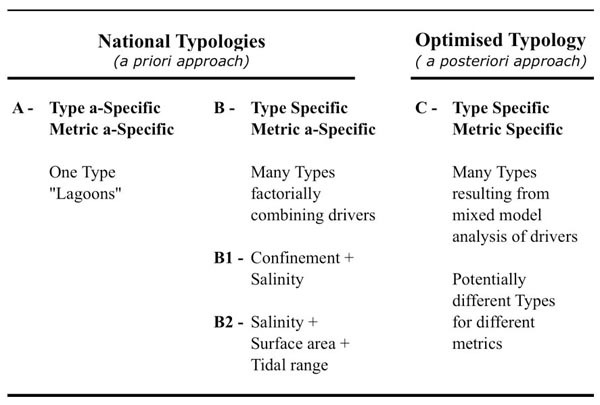 We have considered a set of Mediterranean reference lagoons and of proposed lagoon typologies (Table 1) in order to: (i) explore the influence of potential sources of natural variability on four multimetric assessment tools (BAT, BITS, ISS and M-AMBI); (ii) evaluate type and metric specific reference conditions and related classification boundaries; (iii) test the accuracy of both type-aspecific and type-specific classification boundaries to evaluate the lagoon ecological status. All assessment tools showed a large natural variation both on the spatial scale and temporal. Surface area, tidal range, confinement and water salinity, which are the drivers of the Mediterranean lagoon typologies proposed so far, were actually found to be significant sources of the spatial variability of at least some of the considered assessment tools, with only water salinity significantly affecting all of them. Type-specific reference conditions and classification boundaries were developed, improving the accuracy of the ecological status assessment (Figure 1). The new boundaries of type specific reference conditions gave an accurate description of ecological status when applied at the lagoon level, while they showed a classification uncertainty when computed at the study site level. The definition of type specific reference conditions is an important contribution to the implementation of the WFD in the Mediterranean ecoregion. Anyway, a strong effort is actually required in order to develop procedures minimising the risk of misclassification. This study has been published in WISER Deliverable 4.3-2 (will be available soon) Methodological approaches to the definition of type-specific reference conditions for benthic macroinvertebrates in transitional waters: the case study of Mediterranean lagoons. This study has been published in Ecological Indicators. Barbone, E., I. Rosati, S. Reizopoulou, A. Basset, 2012. Linking classification boundaries to sources of natural variability in transitional waters: A case study of benthic macroinvertebrates. Ecological Indicators, 12: 105-122. This study aimed to assess and model the relationships between physical (depth, sediment characteristics etc) and biological properties (WFD indices, probability of species occurrence) along a gradient of hydromorphological pressure in order to determine the potential changes in the biology if pressures were removed or better managed. That is, the difference between either the high and low impact areas or between high and low impact times would indicate ecological potential. Hydromorphological pressures in transitional waters include flood defence, ports, land claim, weirs and embankments which essentially remove/reduce habitats, especially for intertidal areas, and include steepening the channel profile from the subtidal to the high water mark. Other pressures may include dredging and dredge disposal and thermal or hypersaline discharges. Unfortunately few data collected along specific hydromorphological pressure gradients were found, pre-modification data generally do not exist and where hydromorphological pressures have been removed, the physical environment (and therefore the biology) do not necessarily respond as expected (e.g. shoreline realignment sites). Aggregate extraction provides an example of a hydromorphological pressure which can be removed and is an activity which has been closely monitored. In the assessment for WISER, data were obtained from the Regional Environmental Characterisation Survey (Marine Aggregate Levy Sustainability Fund) for the Southern North Sea which covers large areas of seabed subject to numerous activities causing physical modification. Analysis of these data is in progress. Whilst the definition of ecological potential appears simple, in practice it is poorly understood and difficult to define. At present we have the additional problem of the way in which the terms are used – workers refer to an area being in good ecological potential when in fact we should refer to it as having a potential to be good ecologically (if a pressure is removed or better managed). Furthermore, work to determine reference conditions is being carried out in parallel to this study. Since there are so few (if any) TraC areas which are not influenced by human activity, HMWBs are being used to define reference conditions based on the areas of lowest impact. The distinction between reference conditions and ecological potential is therefore unclear. Finally, there is the fundamental problem that a hydromorphological change can remove part of an estuary while the adjacent areas still have the same species, abundance, functioning and diversity as any area without the pressure being present. A fundamental problem of the WFD is that it considers, for the benthos, a particular site rather than a larger area – hence a m2 area could keep the correct biota even though a large area has been built on and thus lost its fauna.